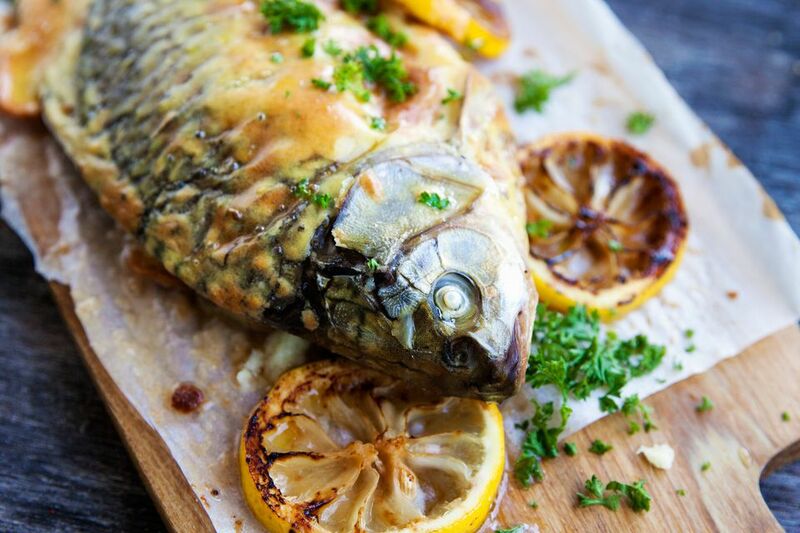 If you have a fresh carp, or other large, freshwater fish, you will want to cook it as soon as possible. Sometimes, you can bring a hooked fish home alive, which is the freshest way to cook and eat fish. If you can obtain a live carp and want to cook it whole, it is best if you let it live in a big tub of fresh water for several days to clean out the "mud vein" and have a better-tasting fish. Dissolve one teaspoon of salt in the tub of water every day to help the process. Do not feed the animal. When it's time for dinner, you can pin the carp against the side of the tub with one hand and stun it with a hammer in the other. The carp should then be gutted and scaled to prepare it for cooking. Carp scales are very large, over 1/2 inch wide. Scale the fish by drawing the knife across the body from head to tail, pressing to dislodge the scales. Rinse the body and throw the scales away. A note about carp in the Chinese culture: Carp are a highly respected food source and since they can jump very high out of the water, they are often pictured jumping over gates, symbolizing a jump in status or wealth. To minimize cleanup, you can fillet the fish before gutting. Begin by cutting into the meat behind the gills with a freshly sharpened knife. This is one task for which you should not use dull knives. Slice to the backbone and ribs, then lift and slice towards the tail. When you are finished, flip the fish over and do the same thing to the other side. If you have not gutted the fish, be careful not to pierce the body cavity. 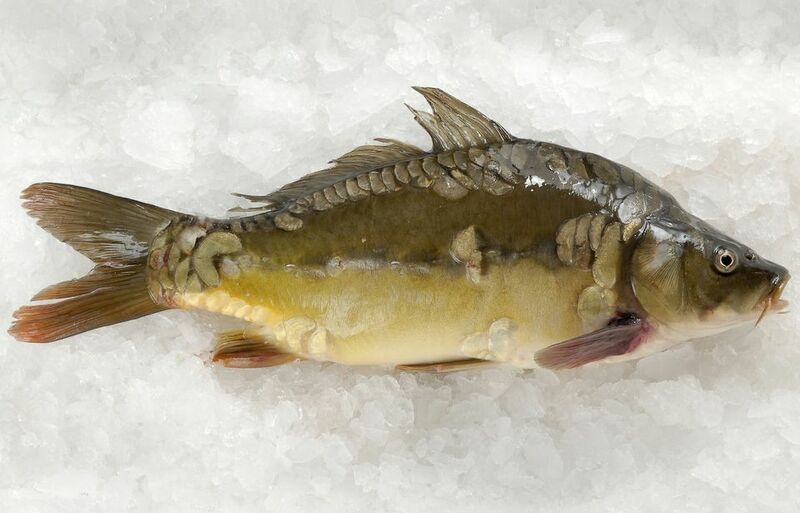 Usually, you can grill a fish fillet with the skin on (salmon, for instance), but carp have what is known as a "mud vein" just under the skin which is nice to remove. You will have to skin them to get to it. With the meat-side up, start cutting gently along the width at one end of the fillet until you can lay your knife sideways in the slit. Carve with pressure toward the cutting board, in long strokes the length of the knife. Hold the skin back with your non-dominant hand. Remove the mud vein by making a v-cut on either side of the dark, lateral line and remove the meat and vein running along it. Cooking the fish is a snap. Heat the oven to 350 F. Butter an 8 by 8-inch baking dish and place carp fillets in it. Cover with a layer of lemon slices to keep the fish moist, or you could place some foil on top. In addition to boiled potatoes with parsley and melted butter, you could add spinach or wilted chard to the dinner for a nice mixture of tastes and textures. Be aware that these fillets still have one layer of pin bones (​gräten) in them. You could pull them out with tweezers before cooking or remove them while eating.